There is a common misconception, especially among artists in other medias, that there is no art to photography. One simply arrives at a beautiful location, clicks the shutter, and records something that was already there. While we are recording nature, fine art photography is much more than that. Photography becomes art when the photographer learns to truly see the scene; using all 4 dimensions to capture a uniquely artistic visualization. By adjusting the parameters of the exposure we’re able to compress or accumulate time. We can leverage that manipulation of time to capture things that they eye, or any other artistic media, simply can’t see. We can change our location, or perspective, to balance the objects in the frame. Just as a painter or sculptor poses their model, we pose the landscape. In a very real sense it’s much less contrived as we are forced to work with what we’re presented with. While it is certainly desirable to have luck on your side, proper planning greatly improves the number of successful images that you’re able to make. This image is a fine example of that planning. The moon in this shot certainly surprised some folks in the area but it was exactly where we expected it to be. Planning before going out to shoot told us where we needed to be to see the moon in this location. It wasn’t luck, it was due diligence. While being able to recognize “magical light” is important, being in the right spot when it happens is equally important. This image was captured with my Canon 30D, using a 70-200 f/4L lens and a 1.4x teleconverter. The exposure was 1/10 of a second at f/18 and ISO 100. It is very easy to blow out detail in the moon so I spot metered directly on the moon and set my exposure one stop above center (+1). The resulting exposure left the foreground darker than I’d hoped so I did some selective brightening during post processing. 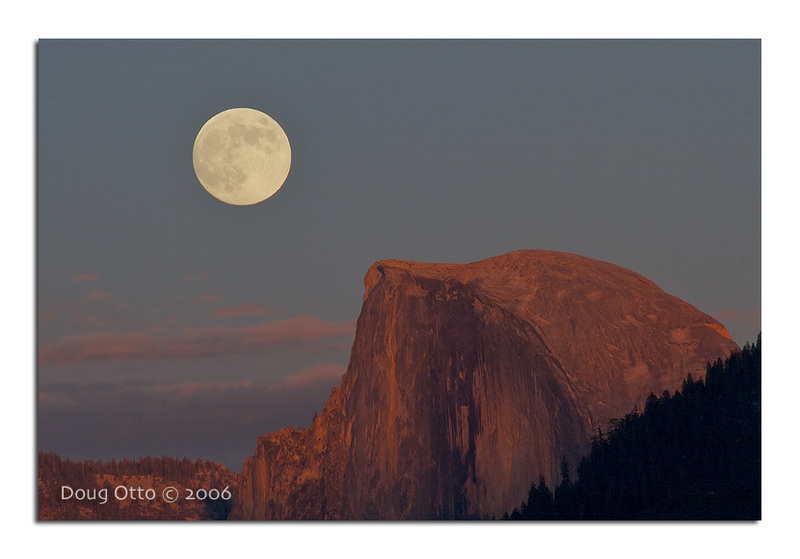 This entry was posted in Photography and tagged Canon 30D, Canon 70-200, doug otto, full moon, half dome, Moonrise, yosemite national park. Bookmark the permalink.